Do you feel weighed down by pressure to do more and be more? Are you weary from carrying all that you feel responsible for? Over a conversation with a woman named Jan I realized that I had a serious weight issue. No, it was not the kind that you face by adjusting food intake or incorporating exercise but the kind that presses down hard on your shoulders and prevents you from living as freely as you could. From a young age Jan carried the weight of being responsible for things that were not her burden to carry. She, now in her fifties, was currently facing health problems and believed that part of the reason was all those years of taking on things in the name of “responsibility” that were not hers to begin with; they had taken a toll on her body. As Jan shared her struggles she shed light on mine too. In my ultra-responsible mindset, I had taken on things that were outside the territory that God had given me. It can be a good thing to be reliable and there are many things that we are responsible for, but we were not made to carry the weight of the world on our shoulders. Jesus died on the cross with the heaviness of sin upon Himself. God allowed that to happen so that we could be set free from the sin that holds us down. May we follow Jesus, the Head above our shoulders; the One able to carry us (and the whole universe too). Dear God, You know that I want others to see me as capable and dependable, but I am tired. I am weary from carrying burdens and I need help. Thank You that You are able, more than able, to do anything. Please help me to lean on You more. Teach me how to rest in Your sufficiency and trust Your ability to rule the universe. Thank you that You care about all these cares I have and You ask that I cast them upon Your capable shoulders. Help me to live free and confident in Your Sovereignty. In Jesus’ Name, Amen. 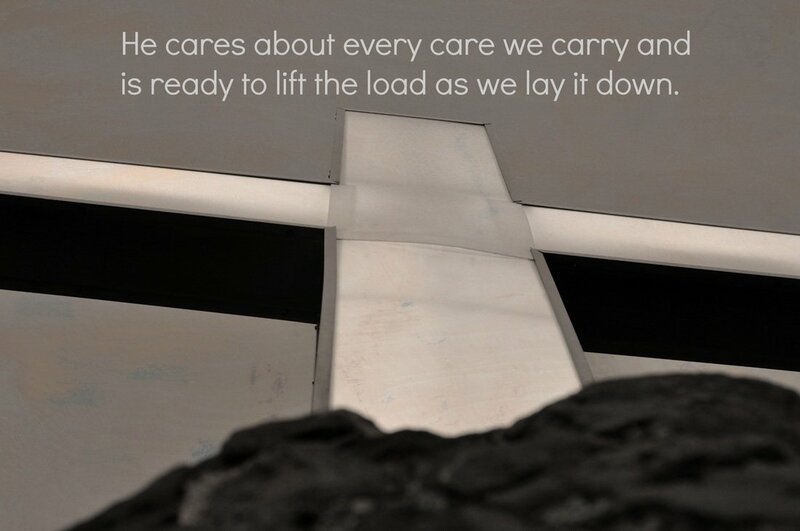 He cares about every care we carry and is ready to lift the load as we lay it down.I’m linking up with Kelly for the #RaRaLinkup and Holly for Testimony Tuesday. Holley for Coffee for Your Heart and Jennifer for #TellHisStory. I love the format you chose for your new daily devotional. Especially the prompt at the end to “stop, look, listen.” This is really great, Katie! The theme you write on resonates with me too. I grew up in a setting where I was discouraged from setting my own boundaries. I see the negative effects of which carrying over into my adult life. I’m encouraged by your post today. Thank you for these words of wisdom. I constantly struggle with this. The hardest part for me to realize is that I’m the decision maker, and I’m the one with the power to let go of those heavy responsibilities I try to carry. It is a yo-yo battle for me. I will let something go, only to pick up something else! Your scriptures are an encouragement today. Thank you! Me too Kristine. It’s an on-going process, isn’t it? Giving over all control to Him… definitely a struggle. But I love the practical reminders you provide that actively remind us how to let go of the things we’re holding so tightly onto, and give to Him. Thank you for taking the time to comment Christine. It’s an on-going struggle for sure. Let’s ask Him to help us learn to live differently as we lay it down. Katie, this is so beautiful. Just what I need to do RIGHT NOW. I’m one of those “overly responsible” people too. This is a great devotional, very encouraging, and meeting a need so many of us feel. Thanks. God has placed a burden on my heart of something similar, that being we take on tasks that He never called us to. It comes as a confirmation to me to hear someone else with a similar message. Thank you! That’s an important message that He’s laid on your heart Trena. Thank you for the encouragement Ruth! Oh, this is beautiful and so fine. The words touch me deeply. They are words I need and want to send down roots deep within and to teach me the way to unravel the burdens I have carried most of my life. As a child, my father was a Navy doctor and would be sent somewhere for weeks or even months at a time. I was the oldest of three girls and he would say to me (innocently), “Now you take care of your Mommy and sisters for me while I am gone.” I took those messages to heart. I was a serious child. Then one day, when I was 12, he died after having pancreatic cancer for 6 months. He was gone again. This time, he had not said those words to me, but I still heard them. The responsibility seemed mine to bear. I still held onto it and did my best. I know that now and have given my burden to Jesus more than once, but know that it is not mine to bear. Never really was. I don’t blame Daddy. We just did what we do because we are human and we love one another. I am so grateful I came here today for I feel the need to pray and make sure I am still not carrying this. I mean my Mama has been gone from this earth for 2 years now. I certainly should not be carrying her and my sisters are grown. Thanks for giving me the freedom to share. Thank you so much Linda for sharing this story. I am sorry about the passing of your parents. Let’s keep growing as we follow His lead. I agree! Wholeheartedly, I agree. We say we know stress is bad for us, but I think we highly underestimate the toll it takes on our health. Thank you for shedding the light of truth. I receive! Beautiful blog post, both the words and the art and format! I am really enjoying the scriptures from Isaiah! Powerful! I try very hard not to carry the burdens alone, trusting in Him, but I admit that sometime I try! Thank you for the encouragement and for the guidance! Oh, thank you for the reminder that I need to stop taking on the weight or burdens He never meant for me to bear. I’m so good at grabbing those up and running (or trying to) with them! Thanks for sharing, I needed this and loved it!! I love this! The format is great and the encouragement is superb. Looking forward to reading more! Really like the format and the content, Katie – very tangible, relevant and practical which just makes God’s word applicable. Spoke to me and stretched me to look more deeply too. Way to go! 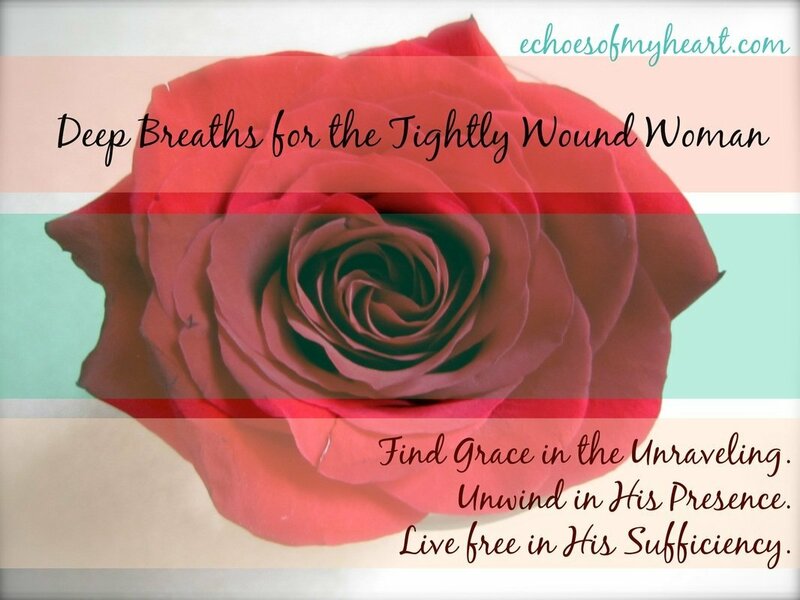 Thank you for this post….there are many of us who have suffered for years with being tightly wound women who need what God is giving you Katie, to set us free. How I thank God for your ministry and that you listen to Him so well, for us all. May God prosper everything you set your hands to. Deut 28.8 and 30.9 “The LORD your God will then make you successful in everything you do. … “Then the LORD your God will prosper you abundantly in all the work of your hand, in the …. a conditional engagement, but declaring an event assuredly to take place. Mary- Words cannot express how much your comment meant to me. Thank you for your blessing and encouragement. Loved it! I especially like, Katie, how you offer a tangible plan for how to change. You inspire with your words only to lead us through our actions. Cheering on this devotion from the #RaRalinkup. Let’s unwind, please God, let’s unwind! Thank you Kelly. And Amen! Excellent! 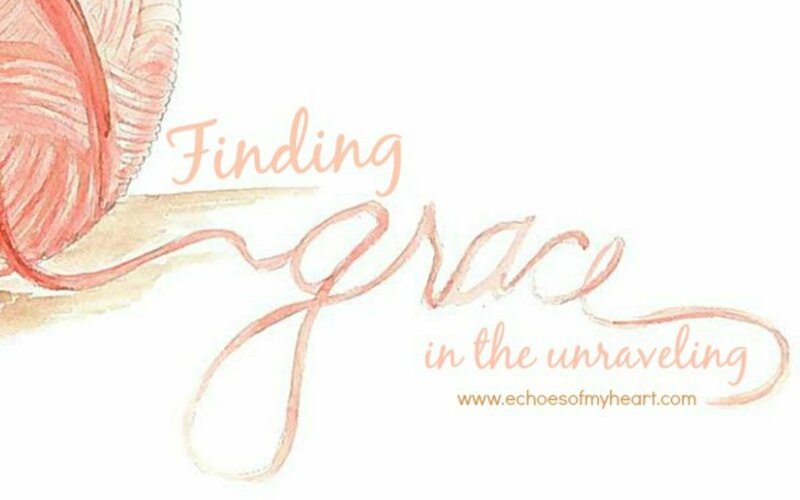 There is a delicate balance between becoming all that the proverbs 31 woman calls us to be and resting. In His rest we find more energy to do the things we need by following His leading. Thank you friend for sharing your heart.